Successfully Added Blue Hybrid - Touchscreen LED Watch to your Shopping Cart. 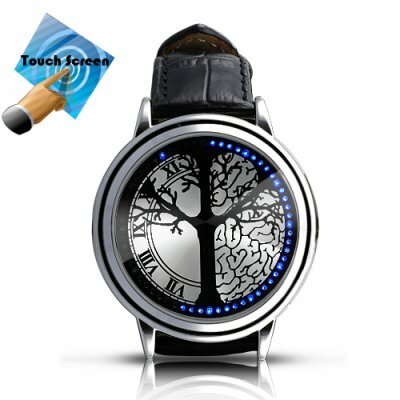 A blue LED touchscreen watch combining future, tradition and modernity! If your fate is to meet aliens during your life you will need courage, intelligence, diplomatic skills and several gadgets such as this half human half extraterrestrial device. Imagine a green (or another color since we don't know yet how they look like) guy getting off an Unidentified Flying Object and asking what time it is on the Earth. You wonder how you would reply? To be exact you won't have to because this watch will for you! Only by pressing it smoothly you will be able to communicate the answer. Indeed blue glows have been found out to be the universal language throughout constellations! This watch was primarily designed with an authentic European style. The first thing you notice when you see it is its elegant design: leather band, stainless steel case, light and discreet. With a closer look you will see its subtle pattern: a tree splitting the screen into two. On the right, according to your imagination, you may see a brain representing intelligence or a labyrinth meaning complexity. On the left several Roman figures give a high class feeling. If it was made in Switzerland there would not be much difference! Several features have been included in this watch to make it up-to-date with the latest technologies. Time is displayed in a new way: hour is indicated by a flashing blue light whereas minutes appear through a line of blue LEDs. It is also power-saving since time shows up only when you touch the screen. And in order to make your life easier a mode that automatically tells you the time every 30 minutes is available and very simple to set! Be a trend-setter and lead the future with this hybrid watch by ordering it right now! Once again this is brought to you by your online leader in China wholesale cool gadgets - Chinavasion.